Geez, we're so far behind. You gonna make it? Taero had boarded a ferry to Kanto, seeing as there was not any direct service to Fiore from Seven Island or any of the others in the Sevii Islands, for that matter. From Kanto, he could probably go just about wherever he pleased, though now that he had the option, he thought about staying for just a little while, perhaps training to earn some gym badges. The ride would only be about an hour, so he sat on a bench on the top deck, looking out over the sea. The mainland was barely visible in the distance, shrouded in a thin blue mist. An occasional Tentacool or Chinchou was visible near the boat, but for the most part, everything that lived in the sea knew to stay clear of the humans and their loud machines. [Are we there yet?] asked Moyuko, impatiently, the wind blowing his fur about. He was sitting on the deck next to Taero, but was not enjoying the view as much as his master. "It'll be a little bit yet," Taero replied, sounding distant, as if deep in thought. He knew that Kanto had major problems with Team Rocket in the past, but he was hoping those days were over. The trainer's hand reached over and scratched his Growlithe companion behind the ears. "Not really. Just relax, it's nice outside. Not every day you get to ride in a ferry like this, especially if you're a trainer, or their Pokémon." "If you'd rather swim, it's not too late to arrange that." "Suit yourself." He stopped scratching the Growlithe's head and propped his arms on the rail, leaning forward. They were nearing a pair of islands, which the captain's assistant quickly identified as the Seafoam Islands, a rather popular training spot with some rare Pokémon hidden in the depths of the caves within. A sailor came and sat next to Taero. "Hey, kid," he greeted, rather bluntly, "you okay?" Taero looked at him, wondering why this man had simply come up and addressed him as such. "Yeah, I'm fine. Why do you ask?" The question he least needed to be asked had already come up. He fabricated an answer so the sailor might leave him alone. "Away. I'm going to meet them in Vermillion." "Oh really?" The sailor did not sound very perceptive, nor did he look it, but anyone could likely have seen through it. "Well, you shouldn't travel alone 'cuz it's not safe. No one's bothered you, has they?" Although Taero did not have a complete education, the incorrect grammar still bothered him. He knew his own was not absolutely perfect, but it was still better than this. "Not until you did." "What's that? You mean I'm causin' you trouble? 'Cuz I can if you want it!" The short temper was more amusing than it was annoying. "Not what I meant," he said, trying to hold in a smirk. "Well I think it's what you meant!" "But o'course you did! What, you wanna fight or somethin'? 'Cuz you are aren't bein' very nice! I'm totally gonna crush you, kid." The ferry suddenly jolted, making him jump. "That's not supposed to happen. I'm gonna go check wit da boss, but you're gonna get it later!" He left towards the cabin. Taero was about to take Moyuko inside, as his skin felt like it was going to burn if he did not move, but another jolt almost threw him to the deck. "Okay, Moyuko, something's wrong," he said, picking up the small Growlithe. "You have any idea what it could be?" [No better than you do,] Moyuko replied, sleepily. [Not like there's much we can do about it anyway. That annoying guy who was around here earlier will take care of it. Or someone smarter will take care of it--] Another sudden motion nearly threw them over again, and they could hear the engine skip for a moment. "Sharpedo!" someone shouted from a lower deck. "There are Sharpedo! We need some trainers down here!" "What?" Taero looked over the side, holding on to the rail. "Sharpedo don't live in this area. They come from the waters around Hoenn. What would they be doing here?" He saw the dark forms darting about under the water, and, as one passed under the boat, the boat shook before it emerged again. "Go, Jumpluff!" someone yelled from below, and, sure enough, a Jumpluff quickly flashed into view in the air below them, floating about. It managed to keep up with the boat in the air just over the water, looking down and seeing the Sharpedo. "Jumpluff, use Bullet Seed!" As the Jumpluff peppered a few of the Sharpedo with seeds, another trainer sent out a Pidgeot. "Pidgeot, use Twister to blow them away!" she shouted at it. It began making passes at the Sharpedo just below the surface of the water, aiming away from the boat to blow the Sharpedo out towards the open ocean. [Hey, Taero, you can help them with that Yanma!] said Moyuko. "Yeah, I was thinking about doing that," said Taero, reaching for the Pokéball. "Problem is, I don't know if he'll obey. You think he will?" Drawing the orb off his belt, he held it back, ready to throw. "I guess you're right. Go, Zephyros!" The Yanma flew out into the sky, keeping up with the boat and obviously not trying very hard to do so. "Zeph, use Sonicboom on those Sharpedo just under the water!" With his keen sight, the Yanma had no problem finding the dark shapes just under the surface of the water, breaking off one by one. He dived towards the water, firing waves of energy into the water before pulling up and looping around the entire boat. He was obviously picking up a lot of speed, even more than the Pidgeot hurling whirlwinds down into the water. Since the Sharpedo were reluctant to fight anything other than the boat, they quickly broke off, but the boat was obviously damaged. It had slowed down significantly, and was tilted to the side a little bit, throwing it off course, directly towards the Seafoam Islands. Shortly, the speakers blared for the passengers to abandon ship, and that this was not a drill. "Don't need to tell me twice," said Taero, calling back Zephyros and heading towards the lower decks, where the lifeboats were moored. "C'mon, Moyuko, we have to hurry!" He started towards the stairs and noted that the Growlithe was not preceding him, as usual. Stopping and looking back, he called. "Moyuko, let's go!" [Taero, it's a little late for that,] he replied, looking over the edge of the boat. The islands were much closer than they had appeared just a moment ago. Hey, Zephyros is obeying him! That's good. I wonder what happens to him, though... 'Cause he doesn't exist in the RP! I guess that's the one problem with this set-up, eh? No major surprises. I did say that it would not completely translate to the RP, did I not? Actually, I do not remember... if I did not, then I meant to say it. Taero strode down the beach, looking at the sand as he moved. It shifted pleasantly under his feet, even better now that his legs were a little sore from the rough landing on the Seafoam Islands. It was a calm day, and the waves washed up against the shore quietly. A few Krabby moved about somewhere ahead, but saw no threat in him and carried on with their business. As usual, Moyuko wandered along next to him, taking about every opportunity to stop and sniff new things. This was a new place to him, and he was always excited to learn about new places. His bushy tail flicked back and forth carelessly, as he continued to pay little attention of the others wandering about on the island while they waited for help. "Well, well," a voice came from behind them. Taero turned to see a female trainer, a bit taller than him. She had smooth brown hair and attire not unlike his own, but without the jacket or hat. "So, you're the kid with the Yanma, right?" Taero turned to look at her, as did Moyuko, almost in unison. "Uh, yeah, I am," he said, taken somewhat by surprise. "What's up?" She continued her approach until she stood before him, offering her well-tanned hand. "Call me Keyara. What's your name?" He looked at it for a moment before firmly shaking her hand. "I'm Taero." "Nice to meet you." She looked at Moyuko and then kneeled down and offered her hand to him. "So, is this cute little fella yours, too?" she asked, as Moyuko sniffed her hand cautiously. "Nice." She scratched him behind the ears quickly, and stood up again, looking at him. "So, I take it that you're a bit new to training Pokémon?" "What?" He was shocked that she could see it. "Heh, I can see it in your manner. Most really skilled trainers are hardly as shy as you are. Don't worry, it's not a problem, everyone has to start somewhere. And, to be honest, looks like you have a good start. You also happen to be the kid who caught that Skarmory, aren't you? That was really smooth." This trainer was obviously very well-informed. He was quite impressed by her apparent keen awareness in the events around her. "Y-yeah, I did that. I traded it for my Yanma." She smirked. "Really? Mind me asking why?" "Uh, sure. I needed some money to get off the island, and, uh, I traded it to another person for my Yanma and some money. Why, is something wrong?" "Not really. I was just kinda wondering. With Skarmory, you get some pretty solid capabilities right away. Yanma, it'll take a while to work up. Don't worry, if you do it properly, you won't regret it at all." That seemed a little harsh. He narrowed his eyes. "What do you mean by that?" "Huh? Oh, nothing, nothing. Sorry. I trust your judgement with that one, I guess. Money is money. Anyway, why did you need money for travel? Didn't your parents provide enough for you?" Even now, quite some time after the occurrence, the topic of his parents was not exacty comfortable. "They're not around." "Ah. Sorry to hear that. Think you'll be alright on your own in Kanto, or are you still a little insecure on the whole trainer thing?" "I, uh, kinda was forced into it. So, not really, I guess." "Oh, I see. Bossy people, huh? Well, not to worry. I wouldn't mind helping you train for a little while. See, I've been a trainer for almost ten years now, and I'm able to make a living on it. I have a house on Pallet Town, as it turns out, and it's a pretty fine place for beginning trainers. It's where Professor Oak's lab is. You've heard of him, right?" He nodded, but hesitated to say anything. His parents had worked briefly with Professor Oak, and it was no better of a subject than it was a minute ago. "I saw him... on TV." "Not surprising. Heck, he has TV on him, and radio shows... hard to escape the guy. Such an authority. I learned a lot from him, and I think it'd do you some good to maybe do a little work for him? He'd surely pay you a bit to assist him with things, if I put in a good word for you. How does that sound?" Taero was, rightfully, a little suspicious of this offer. They had just met, and she was putting forth quite a lot of help on short notice. Maybe she was lonely, or headstrong, or excessively friendly. At any rate, he could not really afford to refuse any aid. "Um, sure," he replied, after thinking for a moment. He had nowhere else to go, anyway. "Great! Well, just tag along with me and we'll get you set up at my place when we get there. I'd always been wondering what I'd use the second bedroom for." Perhaps that was explanation enough: she had a house that was a bit too big. "Thanks, ma'am." "Aww, don't worry about formal title-y stuff. Just call me Keyara. 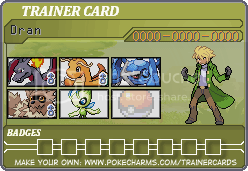 I'm a fellow trainer, anyway." She laughed lightly. "Interesting, I'm rooming with my competition. Hey, how about showing me what you got so far?" "No, no, I don't think that'd be very humane. I know you have your Growlithe and that Yanma, but let's see what all you have." He tilted his head before freeing Zephyros, who proceeded to land on a rock and clean off the lenses of his large eyes. "That's all I have, just Moyuko and Zephyros." "Oh yeah, 'cuz you're a new trainer, you probably don't have lots of Pokémon. Silly me." She scratched her head. "You wanna see what I have on me right now?" "Alright." Keyara took a step back, freeing some Pokéballs from her belt and giving them a toss. "Go, team!" They each popped open, and several different creatures appeared in flashes of red light. First was a Pidgeot, who quickly stood next to Keyara and demanded attention affectionately. A Magneton also appeared, which remained virtually motionless in the air, awaiting orders, as well as a Torkoal, who stared at the Magneton. There was a Cherrim, which opened up facing the sun, and a Cubone, who looked quite confused. "Well, meet the family. They all have names. The Magneton is Magnum, the Torkoal is Toreador, the Cherrim is Cale, and the Cubone, my newest member, is Cobble." She giggled and scratched the Pidgeot's head. "This is Arlette, and she was my first Pokémon ever." "Wow," Taero said, quite interested by the variety of Pokémon. "So these are all of your Pokémon?" "Not all of them. I have quite a few more hanging out at Oak's lab. This is just my current team." "Oh." He still thought it was an impressive assortment. She must have traveled quite a long distance to assemble it. "So, when will we be able to get out of here?" "Sometime soon." She looked out to the sea. "Hopefully, anyway. In the meantime, let's get started on that training." You've been ignoring me on it again. Interesting chapter; obviously he doesn't get a "starter" Pokemon, unless it's an eevee, which I sincerely doubt is how Taero met him. XD We'll see how far this new relationship goes. ...I did, right? This goes way way WAY AU-ish. AU-ish? What does that mean, again? Goodness, I have waited much too long to get back to this. Hopefully I can develop this thing called... consistency. Keyara sat quietly in the backyard, legs crossed and eyes closed. Taero was a few feet away, facing her, sitting similarly but watching her, and with one arm around Moyuko, right next to him. He had changed out his normal set of clothing for a simple black tee shirt and jeans, about the most comfortable type of clothing available on the warm day. After a few minutes of the sounds of nature, Keyara opened her eyes and smiled. "Well, Taero," she said, "it is about time we got started." She adjusted her posture to sit up a little taller, as she had relaxed. "Now, I am curious. If what you told me is correct, you are from Orre." "Yeah," he replied, with a nod. "That's correct." "Okay. I am not all that familiar with Orre. How were you raised to think of Pokémon?" "Um... I was always told to think of Pokémon as friends. I mean, there aren't a lot of wild Pokémon in Orre, so I was always taught to be friendly to them because most of them were owned by people." Keyara nodded slowly and solemnly. "That is... an okay way to think of it. But, as a trainer, you need to think of it a little differently. Pokémon are not possessions, they are friends, this much is true. However, I have come to think of Pokémon as a force of nature. Have you ever seen what most people call... a 'legendary Pokémon'?" She raised an eyebrow in surprise. "Really? Then I presume you know how powerful they are?" "Good. Like I said, Pokémon are a force of nature. People have, for many ages, believed that the legendary Pokémon controlled the natural forces, such as wind, water, and so on. In fact, we have never found evidence to specifically deny those claims, and thus it is not refuted in most scientific texts. We can even cite evidence to believe that the legendary Pokémon are still responsible for balancing natural forces. Thus, it is extremely important to be nice to Pokémon and to never use them for evil." [Yeah, you have to be nice to me,] said Moyuko, looking at Taero. "Hey, not like I was being really mean before," said Taero, looking back at him. "I see that you are already very attached to Moyuko," said Keyara. "That's good. That's very good. If you two were having issues, I would be worried. But I see that you have some trainer in you, at least. You can understand exactly what he wants to say. Admittedly, I'm impressed. That is a skill that many trainers struggle to develop, which is probably why a lot of them eventually quit." She stood up and stretched, then began pacing in front of him. "Okay, first things first. Tomorrow, we're leaving. I need to go see a friend in Fiore's Summertown. I think you should talk to him, actuallly. He is sort of a jack-of-all-trades, and is right now working on becoming a Pokémon Ranger. He first became a trainer around the same time I did, and since he completed his challenge, he has switched around between training and breeding and trying to become a Ranger. His name is Keiji, you've probably heard of him." "Oh, him!" said Taero, leaning forward a bit. "I saw him on TV a few times." "Good. I think you'll get along with him. Anyway, after that trip, there won't be too long until we have to send you on your gym challenge thingy. I think you'll do fine. But I doubt they'll let you use both of your Pokémon. I think I can arrange for you to use Moyuko, at least, but Zephyros, was it? He'll probably have to stay with me until you earn some of those trainer perks. Then I can trade him back to you. Maybe, by then, he'll obey you, too." "Okay, I think I can live with that." "Also, think about what region you'll be challenging." Keyara nodded. "Yep. It would be easier for me, of course, if you chose Kanto or Johto, for obvious reasons, but if you would prefer Hoenn or Sinnoh or somewhere else abroad, we can get that going, too. Trust me, this is a big decision, so think carefully." Taero and Moyuko tilted their heads essentially in unison. "Which one... would you recommend?" She shrugged. "I dunno. I've been around most of 'em. They all have their charms. I think the biggest deal was the selection of Pokémon that you get, and even then, if you really want something from another region, you can probably get a trade for it, especially now that they have those Global Trade Centers springing up here and there. If I had to give weight to one of them, I would probably say Kanto, but just because it's the most prestigious of the nearby leagues. It's tough, though." She looked over at the deck and went to go collect something. After a moment, she returned with a PDA of some sort and stood over him. "Now, like I said, we need to get your training started, so I'm going to quiz you. After that, we do exercises. Gotta be fit. Then, I will have you and Moyuko wander around my place and befriend my Pokémon... and come back with a team of six that is capable of effectively attacking any known type by dinnertime. Okay?" Taero's eyes nearly popped when he realized how soon that would be. "All that? Really?" "Hey, I said we had a tight schedule. Are we getting started, or what?" He sighed, relaxing somewhat. This training sounded a lot tougher than her demeanor made it out to be originally. He raised a hand to Moyuko's head and scratched him behind the ears. "Well... I guess." "Good." She nodded. "First lesson of being a trainer: always be ready for anything." Eh, random fast write. Gotta get stuff moving, though.